More than a decade into its lifespan, World of Warcraft is still one of the biggest games in the world. Other games made by Blizzard—like Starcraft or Diablo—boast huge sprawling worlds, too. But they're trying to make Overwatch a bit more... intimate. Announced last year, Overwatch marks a big departure for Blizzard. It's a team-based shooter, where two teams of six heroes face off against each other. As such, the upcoming game is operating at a scale that's not as broad as Starcraft or Diablo but not as narrow as Hearthstone's two-player matches. According to game director Jeff Kaplan, a lot of decisions about Overwatch are still up in the air. For example, he says they don't know yet if Overwatch is going to be subscription-based like WoW or free-to-play like Hearthstone. I talked with Kaplan at PAX East last week to try and find out what Blizzard might be thinking about with regard to a single-player component to Overwatch and whether there's a console version in the works. In the videos shown here, you'll see me talk to Kaplan and take newly-announced character Zarya for a spin. 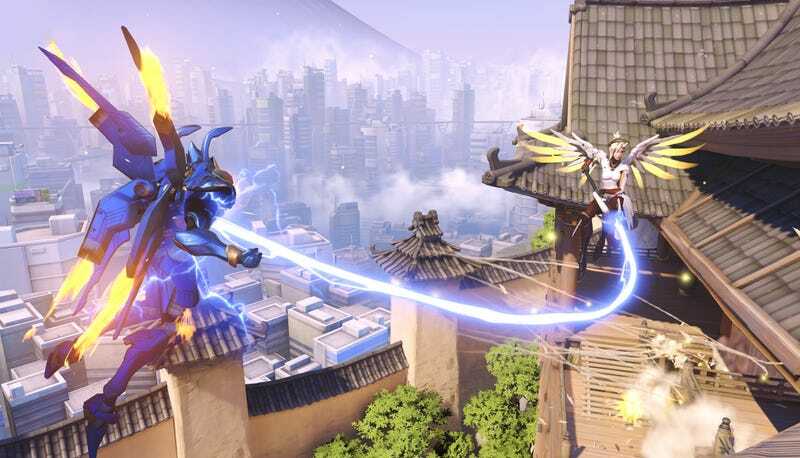 Part of the challenge that Blizzard faces with Overwatch, says game director Jeff Kaplan, is to have players connect with Overwatch's brighter yet more realistic gameworld in a way that makes it more than just a backdrop for headshots. Whether there's a more diffuse focus on narrative or not, I definitely want to play Overwatch more.